Looking For An Angel, Inc. is a nonprofit organization in Ferguson, MO that is dedicated to bringing missing persons back together with their loved ones. We assist families in reporting their missing relatives and help them navigate the entire search process. Our nonprofit organization strives to serve as a strong support group, and we hold special activities and events to increase awareness about missing individuals. Some of our efforts include flyer/literature distribution and speaking engagements. In addition, we assist with search and rescue operations and collaborate with other organizations to address the epidemic of disappearances. Continue browsing our website to learn more about our cause. 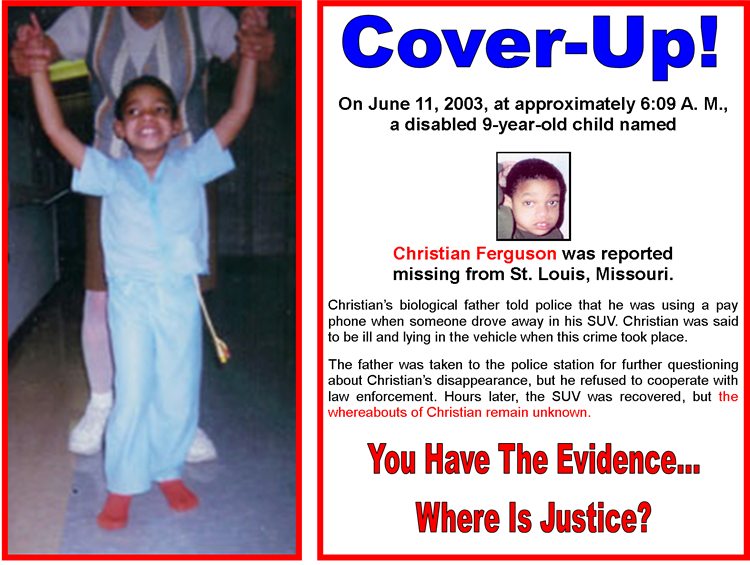 On June 11, 2003, at approximately 6:09 am, a disabled 9-year-old child named Christian Taylor Ferguson was reported missing from St. Louis, Missouri. Christian’s biological father told police that he was using a pay phone when someone drove away in his SUV. Christian was said to be ill and lying in the vehicle when this crime took place. The father was taken to the police station for further questioning about Christian’s disappearance, but he refused to cooperate with law enforcement. Hours later, the SUV was recovered, but the whereabouts of Christian remain unknown. Looking For An Angel, Inc. would like for those grieving the disappearance of a loved one to know that we are working to end your pain and suffering. We are praying for the safe return of all missing persons. Our foundation is here for you. 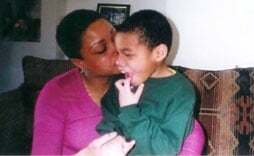 Looking For An Angel, Inc. was created in memory of Christian T. Ferguson. The mission of this nonprofit organization is to increase awareness of and raise monetary rewards for missing persons. Theda Wilson, the founder of this organization and the mother of Christian Ferguson, has been doing all she can to make sure that the public and world knows about the disappearance of her little "angel." Her loss and pain has driven her to do the same for the families and friends of other missing persons. If you are grieving the disappearance of a loved one, please know that Looking For An Angel is here for you. We are working to end your pain and suffering, and are praying for the safe return of ALL MISSING PERSONS. Please call Wesley Bell, St. Louis County Prosecutor, at 314.615.2600 and let him know you want justice for Christian Ferguson! Join us as we give hope and help to the families searching for their long-lost relatives. If you have any questions about our nonprofit organization and our cause, don’t hesitate to call or email us. One of our representatives will attend to your inquiries as soon as possible. Looking For An Angel, Inc.